Choosing a Tarot deck is a very personal journey. You should feel a special connection to the cards—one that allows you to strengthen your intuition and use it to interpret the unknown. There are so many Tarot decks on the market featuring beautiful illustrations and advanced symbolism. However, what may work for your friend or your Tarot teacher may not work for you. So, how can you go about finding the perfect deck? 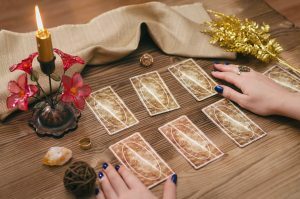 Well lucky for you, we’ve looked at the cards and compiled a few simple guidelines for choosing the best Tarot deck for your personality. Tarot readings require you to channel your spiritual energy in order to look into the beyond. This is why it’s so important that you choose a deck that jives with your intuition. You should feel a connection to your deck and a sense of ease as you navigate the cards. If you have an opportunity to examine the deck in person, do it. Even just holding it in your hands could give you a sense of the deck’s energy and whether or not you’re connected to the cards. Shopping online? Look through the illustrations and see if they capture your attention. You should feel drawn to the symbols on the cards. Follow your intuition. 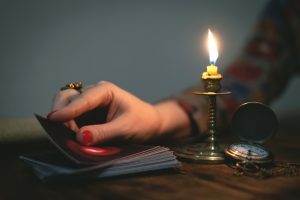 Many Tarot readers start with a deck they were gifted from a friend or teacher, but it’s important to take the next step and invest in a deck of your own as you become more advanced. 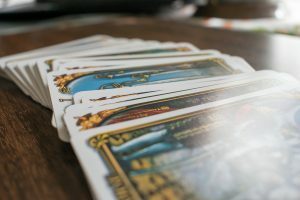 If you’re still relatively new to Tarot, it may be best to start with a popular deck that is easy to understand and interpret. These decks often have clear imagery and symbolism that makes interpreting the cards straight-forward. 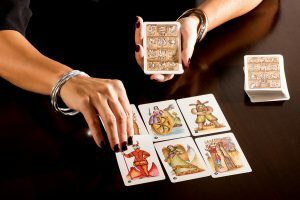 More advanced Tarot readers may prefer more abstract or complex cards. These could reveal deeper meanings and predictions. Tarot reading is an ancient art that has spread across many cultures around the globe. Some cultures incorporated mythological Gods. Others borrowed symbols from astrology. This being said, Tarot designs are still evolving today, with countless decks available that can match anyone’s personal style. This evolution over time is one of the things that makes Tarot cards so fascinating. If you prefer traditional styles, consider shopping for hand-painted cards with traditional major and minor arcana. There is a special mysticism that comes with using a traditional deck. It transports you back to the olden days. This is also an opportunity to choose a deck that reflects your cultural roots and draws on the energies of generations past. If, on the other hand, you’d like something more modern, look for a deck that compliments your personality and unique style. In this golden age of tarot card production, there are so many options featuring beautiful illustrations that are relevant to modern times. When choosing a deck, it’s important you feel connected and drawn to the imagery on the cards. With tarot readings, aesthetic is key. From the style of the deck to the color pallet to the actual symbols, you should be able to look at a card and instantly feel connected to its meaning. Most basic decks feature 22 major arcana cards and 56 minor arcana cards. The minor arcana cards typically have 4 suits. In traditional Italian tarot decks, the four suits are batons, swords, coins, and cups. Modern occult tarot decks, on the other hand, often use wands instead of batons, and pentacles or disks instead of coins. It is important to examine both major and minor arcana because sometimes the images between the two sets differ in style. Viewing as many cards as possible can ensure you feel drawn to the deck as a whole and that that you find the illustrations visually appealing. Tarot cards are meant to be handled often. That’s why it’s worth the investment to get a good quality deck. Cheaply made cards may start to show wear and tear quickly. The corners of the cards may start to bend or even tear. This could throw off the whole energy of the deck. If you plan to use your cards on a regular basis, make sure they are made of thick cardboard. This ensure that they will last for many years of readings to come. Many tarot cards incorporate historical or cultural elements into their symbolism. Some may refer to the cultural origins of certain tarot traditions. Others may incorporate elements of modern society to add another layer of complexity to the deck. If your deck features unique artwork, you can usually find the explanations of the symbols in the little white book that will come with your cards. Understanding the meaning behind the illustrations will not only make it easier to interpret the symbols, but also help you build a stronger connection to the deck. Today, Tarot cards come in a variety of sizes. These may or may not be better suited for you depending on your needs. If you mostly plan to use Tarot cards at parties or group readings, Giant Tarot cards make it easy for everyone to see the symbols. These oversized cards are a lot of fun. However, they are a bit impractical for personal or frequent use. On the other hand, mini tarot cards are great to carry around in your pocket or your bag for readings on the go. Thanks to their small size, it is easy to pull your mini deck out at any moment if you’re needing a bit of guidance. For professional use working with clients, regular sized decks are the standard and are the easiest to handle and shuffle. If you’re an avid tarot card reader, having a few different decks of different sizes can make sure you’re ready for any occasion. One common misconception that beginners have is that you have to pick one deck and stick with it. This couldn’t be farther from the truth! Many Tarot readers work with multiple decks. They choose a different deck depending on the energy of the day or the aura of the person they are reading for. Having multiple decks allows you to select the one that you feel most connected with in the moment. Some days, you may be more drawn to traditional symbols, like medieval figures, or Greek or Roman Gods. Other days, you may be drawn to modern occult decks. Perhaps these feature fairies, astrological symbols, or even just abstract artwork. Having multiple decks on hand also allows you to channel different energies. For example, working with Greek Gods may give you a sense of power and certainty. Working with astrology symbols could make you think more abstract. If you’re in the market for a new Tarot deck, know there isn’t a “right” or “wrong” way to choose your cards. Nevertheless, keeping these 8 factors in mind can make it easier for you to choose the perfect deck for your needs. Whether you’re a beginner or an advanced Tarot card reader, it’s important to choose a deck that speaks to your intuition. For some, that might mean working with a culture-specific deck that draws on ancient traditions and symbols. For others, that might mean choosing a personalized deck that incorporates some of your modern interests. Whatever the case may be, there are countless decks to choose from and finding the perfect match is your own personal journey. In the end, what matters most is finding the cards that speak to you.